I suppose I should let you in on a little secret as to one of our favorite “traditions” that we have, just the two of us. For our Valentine’s Day celebration, we like to fondue. We’ll clear off the coffee table, set out bowls of dippable fruit, vegetables, & proteins…and have ourselves a wonderful & relaxing meal while watching movies. We received a fondue pot (the kind you can use Sterno with) as a wedding shower gift – it came with both a glass pot and a metal pot. The glass one broke…so a few years ago my sister gave us a new, electric one for Christmas. This year one of the movies we watched was West Side Story. I’ve seen this movie so many times, yet Mike never had. It was really hilarious to watch this with him and hear all of his commentary. As you can imagine, it’s those comments that often people just keep to themselves 🙂 The best part is that my husband truthfully does appreciate musical theater – he just likes to make comments to make me laugh! Turn on your fondue pot. Combine first four ingredients and stir until the cheese is melted. Add hot sauce & worcestershire sauce (to taste) and stir to combine. Serve with your favorite dippables! 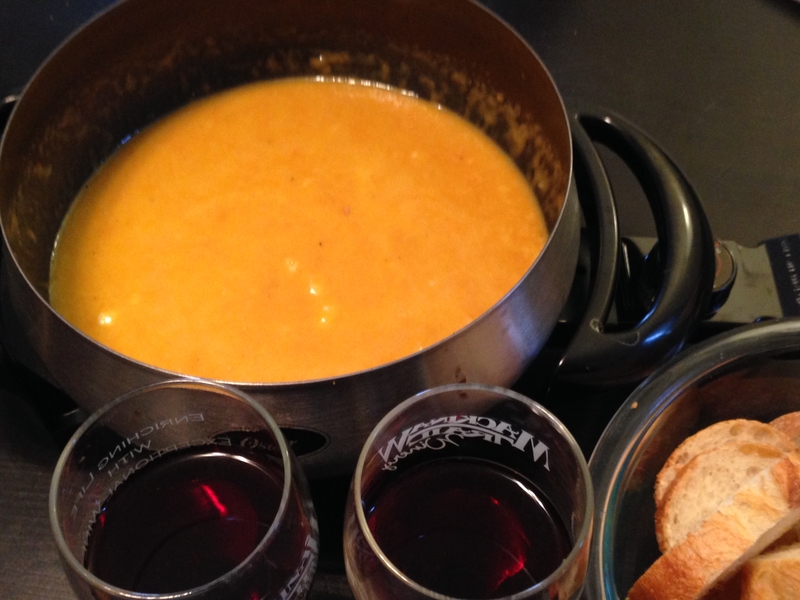 Alright, so maybe it’s a little odd that we drank red wine with our beer-y cheese? Oh well. It was awesome anyway. We ate our cheese fondue with some crusty French bread from Breadworks. I also bought some broccoli & an apple to slice, but in the end we decided to keep this course a bit simple. For our next course, we opted for a broth fondue to be a bit healthier. I had a quart of mushroom broth lurking in my pantry. I supplemented it with some chicken broth as we cooked along, and threw in a clove of garlic. Our favorite dippables (cookables?) for our broth fondue were some chicken, beef, mushrooms (my favorite), red onion, and potato. Next time I may copy what Kristin did on Iowa Girl Eats and try some tots or french fries. Bell pepper and zucchini can taste pretty good, too. Truthfully, whatever you feel like cooking up in the pot – try it. You won’t be disappointed (and if you are, just don’t make it next time). Oh – I can’t forget about the sauces! We made a simple soy sauce/teriyaki/ginger/sriracha one, a horseradish-mayo sauce, some honey mustard, and some barbecue sauce. All were delicious – I made them up on the fly, but next time I think I’ll do a bit more internet research so I can make (and memorize!) some winners. Do you ever fondue? What are your favorite things to fondue? 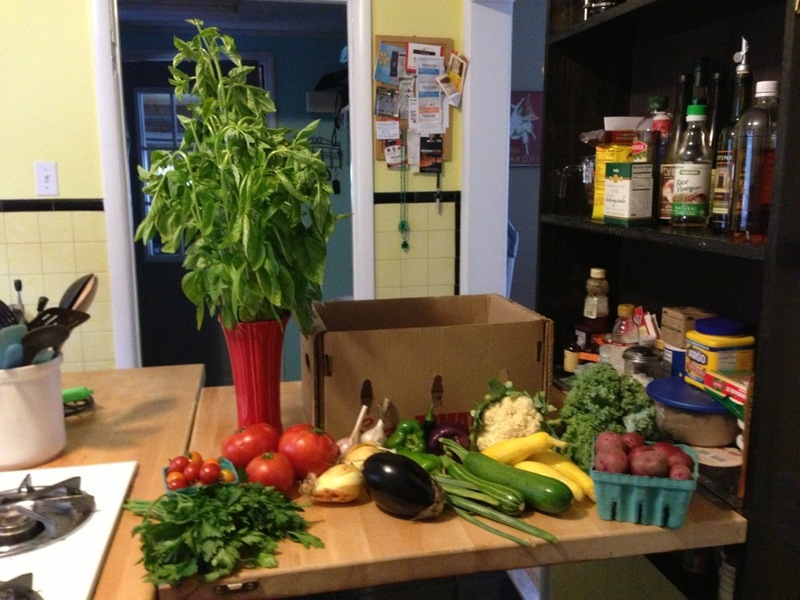 This week’s CSA was still chock-full of goodies, as usual. 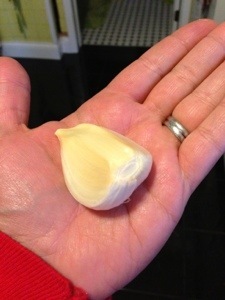 Yep, this is ONE clove from this week’s garlic bulbs! The cherry tomatoes have been used in a chopped caprese salad that I reblogged the other day from Inherchucks. The cauliflower was roasted right away with some garlic & olive oil, and served alongside our favorite meatloaf from a local butcher (which was definitely a comfort-food choice with the colder weather we’ve had). I brought home two bulbs of garlic and decided to roast one, using AnnieRie’s technique. The oven was nice and warm from the meatloaf & roasted cauliflower, so it was the perfect time to do so. Coveyou’s garlic has some large, large cloves this year! The garlic clove that I had chopped to go with the cauliflower was pretty big, but the ones coming from the roasted bulb were even bigger – and photo-worthy, even. The roasted garlic gloves (the final count came to 4 or 5 for that bulb, wow) are now sitting in a small glass jar in the freezer, and will be perfect on the breads I’ve bought home this week. 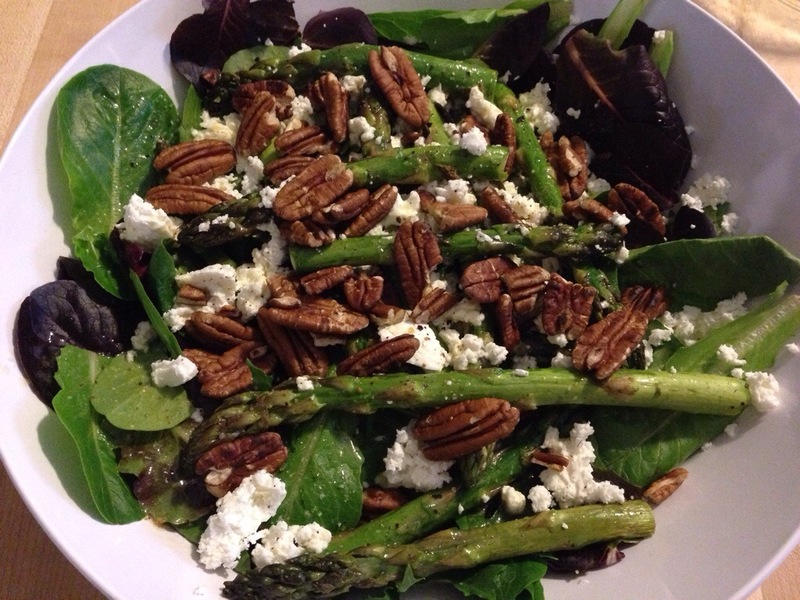 In case you haven’t noticed, I have a new page up on the Spicy Simmer, called What’s for Dinner? Here you can get an idea of what we’re planning to eat all week, as well as the CSA vegetables that we need to use cook with. It’s ever-changing, depending on work schedules, gathering with friends, and spontaneous trips to the grocery store. It’s also a great way to get a sneak peak as to some recipes that may be appearing on here. QUESTION OF THE DAY/WEEK: I now have 1 and a half bunches of flat-leaf parsley. What to do, what to do? Any ideas? 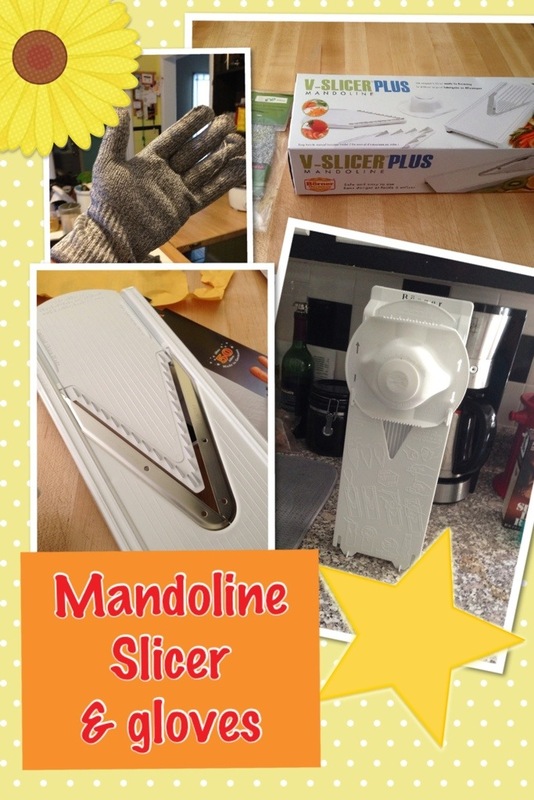 Recently, my husband & I decided to buy a mandoline slicer for our kitchen. He wanted to make homemade potato chips, and I wanted something that could julienne & thinly slice vegetables. I did some research online and ended up ordering the Swissmar Borner V-1001 V-Slicer Plus Mandoline 6 Piece Set . It comes with 3 blades and has the ability to “slice, julienne, or shred”. So far we’ve tried two out of the three – and we’ve both loved the results so far! When the mandoline first arrived, it was on a Wednesday – which in our house is Potluck Night at the community garden. We had several homegrown potatoes, so we decided to make some hashbrown casserole (my stepmom-in-law’s recipe, which typically uses frozen hashbrowns). After reading the directions, I put the blade that I wanted into the mandoline (shredding), stuck a potato on the safety holder, and began to slice. Shredding is pretty tedious, but it still went faster than using a cheese grater! I also purchased some protective gloves for my hands. Amazon recommended this as an add-on item and I totally took the bait. Why? Because my husband & I are accident-prone and that mandoline blade is SHARP. My husband used the mandoline this past Sunday for 1) breakfast potatoes, and 2) homemade potato chips. Once I showed him how to set up and use the mandoline, he immediately got to work. He sliced the last of the homegrown potatoes (save two for a meal) and threw them into the deep fryer. They were absolutely delicious and perfectly crunchy! After he was done using the slicer, I washed it off, turned the reversible plate around for thicker slices, and quickly sliced through the cucumbers that I wanted to pickle. It was so incredibly easy, and much more consistent than trying to cut with a knife. I think that this is going to be a fantastic tool to make stir-frys with, too. It doesn’t take a lot of room to store the mandoline, as this one is designed to hold the blades in two small compartments on the back. I typically store the julienne & shredding blades back there so that if the food holder falls off its pegs (during storage), the super sharp, pointy blades are not exposed. Overall, I’m very happy with our purchase and I think that it’s going to be a very convenient tool in the next few months as we process our CSA vegetables, prepare food for potlucks, and just enjoy cooking in the kitchen together! * I was not compensated in any way, shape or form for my review of these products. These opinions are soley my own – my goal is to spread the word about products & gadgets that are new to me and that which I find to be convenient & worth sharing. Photo created with PicCollage. We’re members of the local community garden and every Wednesday night, we have a potluck & garden work night. 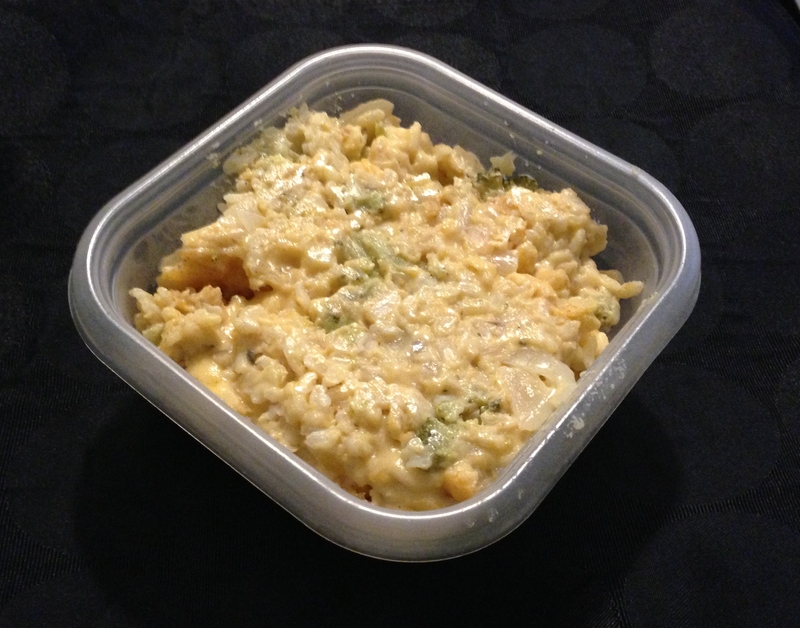 This week, Mike suggested that we make cheesy broccoli rice casserole. It sounded like a great idea, since I knew it would feed a lot of people, and who would think to make that on a warm night in June? Plus, it’s once of Mike’s favorites. Mike has loved “broccoli cheesy rice casserole” for as long as I can remember. It has to be made with Velveeta, or some sort of plain old American/Cheddar cheese, but not nacho cheese – because it’s sheer and utter disappointment. I suppose it’s just one of those comfort foods he always grew up on. But here’s a confession for you: we’ve been married for almost 5 years, and I believe this is the first time I’ve made this dish. Sad, right? I know damn well that he loves it, but I guess I just never got around to making it. Wife of the half-decade right here! When I went to the store to get ingredients, I started to panic, as I could not seem to find that sinful block of processed cheese food – the main ingredient in the dish! Thank God for iPhones, as before you knew it, I had a substitute for Velveeta that tasted better, and was probably a bit more healthier. And I’m glad for that because the block of processed cheese food kinda grosses me out. Preheat the oven to 350*. Cook rice in water according to package directions (or, use a rice cooker). While the rice is cooking, melt the better into a large skillet over medium-high heat. Add the onion and cook until the onions are tender, but still have a bit of a crunch to them. Turn down the heat to medium/medium-low and add the soup, milk, pepper, and cheese. Simmer, stirring often, until the cheese is melted and the mixture thickens. Add broccoli and rice. Mix well and spoon into a 9×13 baking dish, coated with cooking spray. Sprinkle breadcrumbs on top of the casserole. Bake, uncovered, for 30-40 minutes until the edges turn light brown and the casserole is nice and bubbly. The casserole was a big hit at our potluck. I doubled the recipe and the above was all that was left – the perfect amount for someone’s lunch. My toughest critic said that he missed the ‘taste’ of the Velveeta, but that it still tasted pretty good. I’ll take that as a win. Not only because I was able to create a Velveeta substitute, but because I finally made one of my husband’s favorite dishes that has gotten overlooked over the years – recipe SAVED! This post has been a work in progress for quite a while. And it’s long. But if you’re curious as to how beer is made, read on. 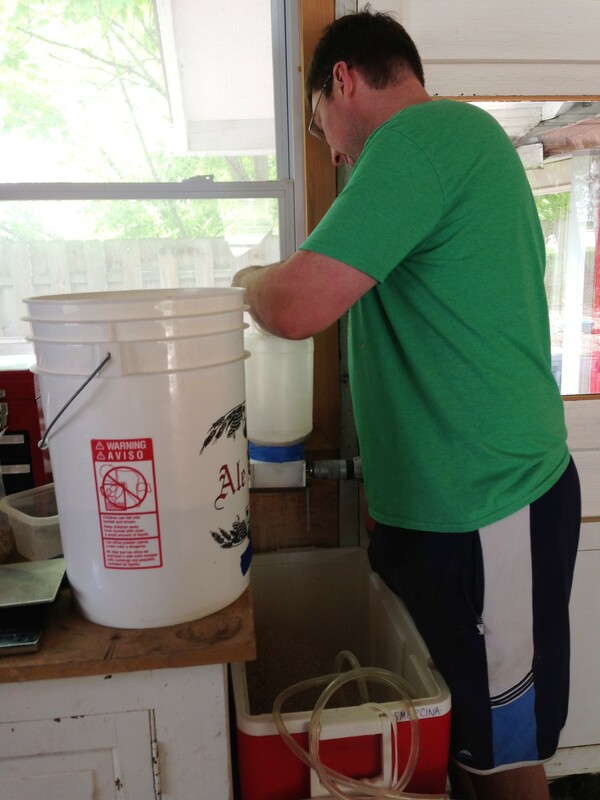 …he began doing a lot of research on homebrewing. Buying lots of books, reading up on the internet, etc. Later that fall, happily employed, he upgraded his system to simply a 5-gallon bucket, kits with liquid malt, & bottling system. 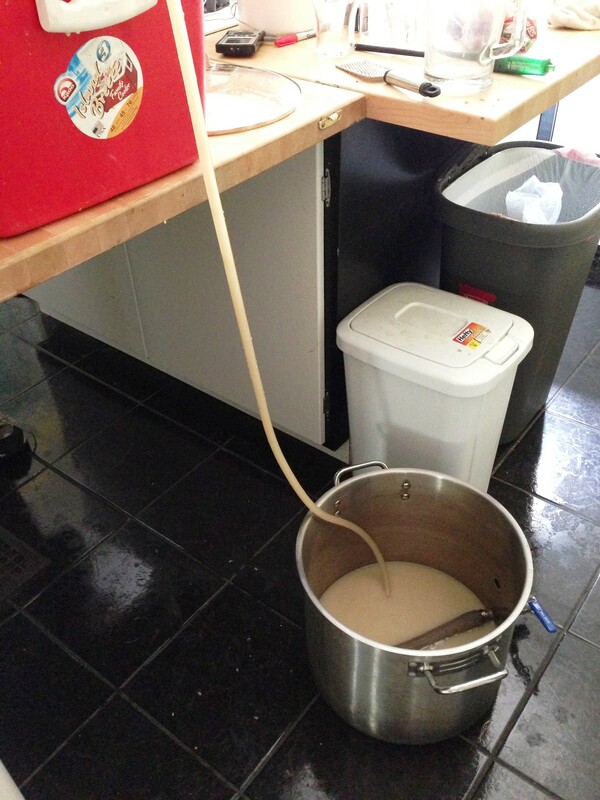 In 2010, we switched from bottling all our beer to kegging all our beer – quite a sight when you live in an apartment. 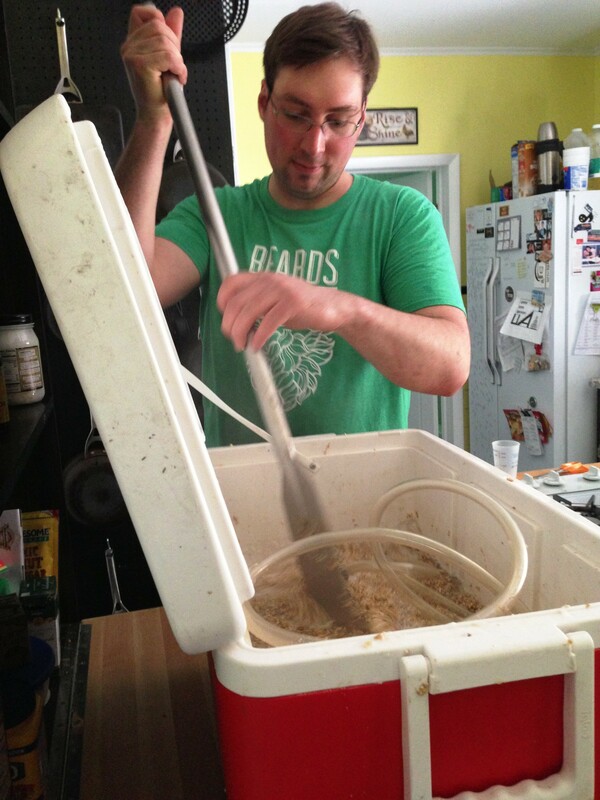 In 2011 we moved into our house, and shortly after we moved from using beer kits to all-grain (making beer through the use of crushed grain). The amount of gadgets, books, tools and supplies that we’ve accumulated over the past 4 years is both impressive and mind-boggling. Yet, it’s a hobby I do not see us letting go of any time soon. With summer coming on, we are constantly brewing beer for gatherings to attend, and guests to entertain. Thus, we wanted to give you an inside look at how we brew. 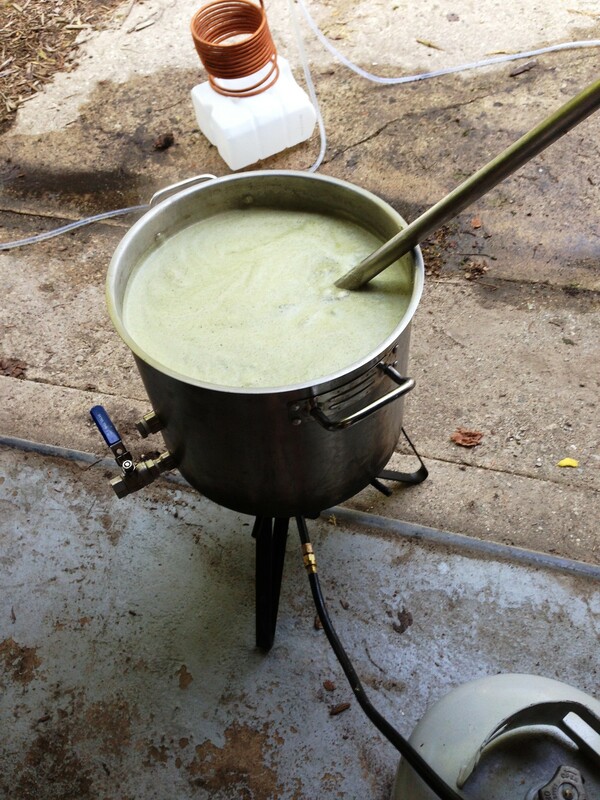 Mike creates a recipe with the help of a beer brewing software he purchased. He determines the type of beer he wants to make, then calculates the ratios of grain/malt, hops, water, and special sugars, spices or other fun things to add. Sometimes Mike will come up with the recipe weeks in advance, so that he can order supplies from the internet and plan ahead for future brews. mash. 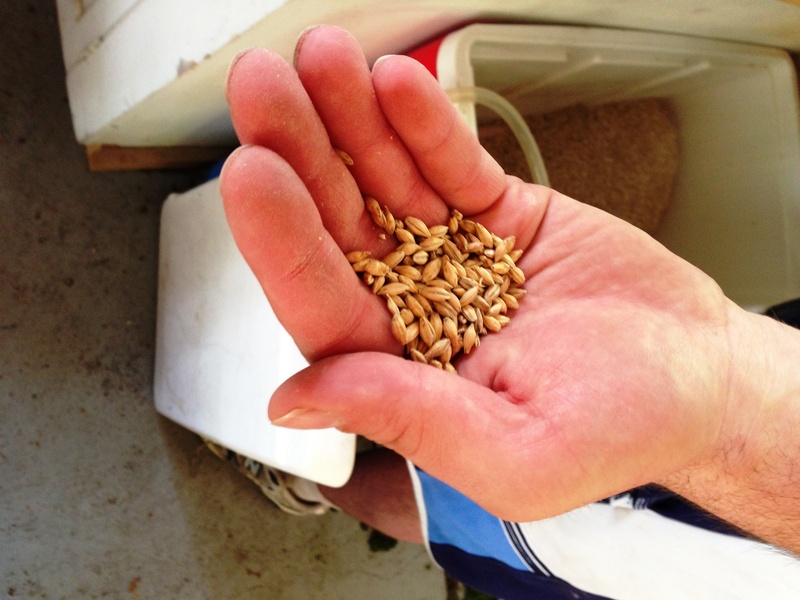 Mashing is where you break down the starch in your grain into fermentable and non-fermentable sugars. Before you process your grain, you need to crush it with some sort of grain mill or grinder. Mike’s grain mill is operated via his cordless drill, which I have to admit is still kind of funny to watch. He weighs out exactly how many pounds he needs into a 5-gal bucket, processes it through the mill, and into the mash tun (the vessel we use for mashing. brewing. You add it a little bit at a time, stirring it constantly with a paddle to make sure all the water gets dispersed throughout the grain. After that, you close the cooler and let the grain sit, periodically checking its temperature – which needs to be at a lower, specific temperature than the hot water you added. You always have a pot of hot water on the stove, though, to add to the grain if it cools off too much. You let the grain sit for at least an hour, so that the sugars are extracted from the grain. Once the grain has sat long enough, you drain it into the boiling pot. Because of our mash tun set up, we are able to drain the wort (liquid) via siphon into the brew pot. The leftover grains make great cow feed and/or compost. The wort is now ready to brew. Instead of using our stove (which can be really obnoxious when you want to cook dinner, or it’s too hot to use the stove), we boil our wort on a propane turkey fryer. This system has worked very well for us, except with three feet of snow and negative temperatures outside (then I let my husband brew in the house ;-)) The boil process typically lasts an hour or more. During the boil process, you have to keep an eye on the temperature and the clock. If the temperature gets too high, you risk a boil over – creating a loss of product and a huge mess. You need to watch the time, as there are certain points in the boil where hops, fruit peels, sugars, etc. need to be added. After all hops & additives have been added, it’s time to cool the beer. We have a wort chiller (seen behind the brew pot) which attaches to a hose or kitchen sink & is placed inside the brew pot. When the water is turned on, it runs through the coils and helps cool the beer faster – a process that without a chiller can take several hours (unless, it’s winter, then you just sit the pot in the snow!). Once the beer is cooled to the specific temperature needed (“room temperature”, so I’m told), you transfer it to either a 5-gal bucket, or a glass carboy to ferment. You then add the yeast. The yeast eat up the sugars and cause them to release carbon dioxide, thus creating alcohol. The more sugary the beer, the higher the alcohol content. From there, you at least a week or two for the wort to ferment and the yeast to do their work. You then transfer the beer to a clean keg, or to a clean glass carboy if you want to do a secondary fermentation (that’s for another day, folks). You then carbonate using priming sugar (bottles) or CO2 (kegs). And serve nice and cold. AND THAT, MY FRIENDS, is how we homebrew.